With Christmas behind us and a new year on the horizon, it’s time to abandon the sweets and concentrate on party fare. Cocktails and savory tidbits are what we need to ring in 2010. New Year’s Eve calls for something a little more elegant than the usual wine, cheese and crackers – something with sophistication, flavor and flare. 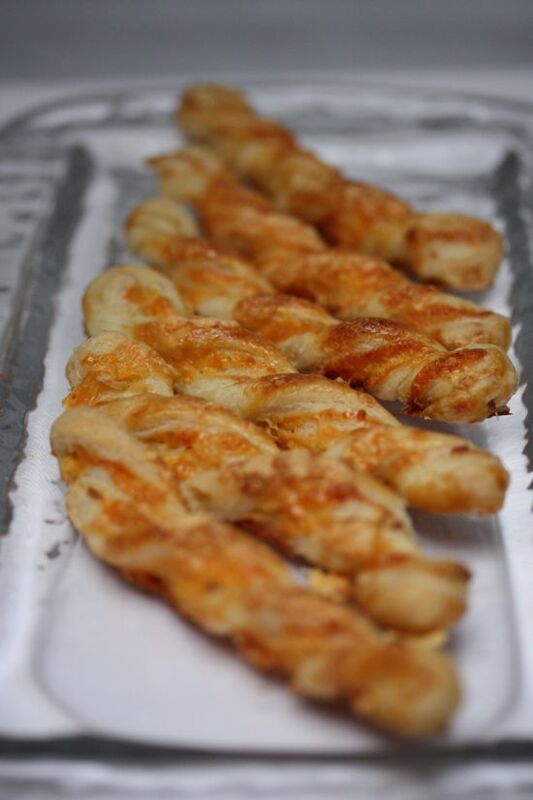 My nominees this year are sidecars and freshly baked pastry twists loaded with garlic and extra sharp cheddar. Although I’m not really a cocktail drinker, I do love a well-made sidecar with its refined balance of cognac and citrus. It’s a classic, dating back to the end of World War I, and it makes me feel worldly and urbane. As one story goes, the drink was named after the motorcycle sidecar in which an American Army captain was driven to a Paris bistro, where the cocktail was his signature tipple. 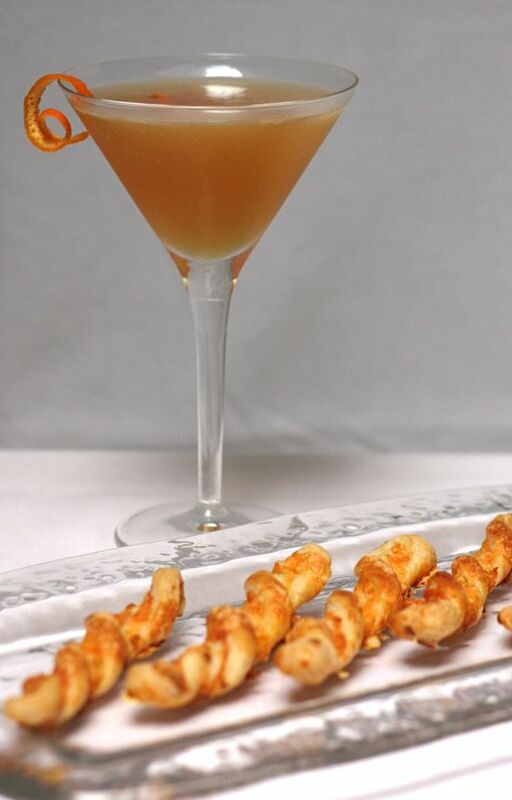 Aromatic garlic cheese twists are the perfect accompaniment to the tart and fruity cocktail. These tidbits are patterned after the chewy twists, sharp with cheddar and pungent with garlic, sold at Gayle’s Bakery in Capitola. I somehow manage to buy a couple whenever I stop there, no matter what’s on my shopping list. Gayle’s garlic twists are made with croissant dough, though, and much too large for cocktail party finger food. I’ve shrunk them to little two-bite munchies made with amazingly versatile puff pastry. The texture is delightfully crisp and they sing with garlic and cheese. Extra sharp cheddar is essential here. Milder cheddar is overpowered by the buttery pastry. If you want to speed up production, you can make them with commercial puff pastry from the freezer section of the supermarket – preferably the all-butter pastry from Dufour. It’s pricey but delicious, versatile and extremely easy to handle. Just thaw it in the refrigerator before rolling out as directed. In the interest of saving a few bucks, I made the twists with an almost instant puff pastry pulsed together in a food processor. The recipe comes from Bernard Clayton’s venerable “The Complete Book of Pastry, Sweet and Savory” (Simon & Schuster, 1981) and was passed along to me by my friend, Carolyn Berke, who once worked as a professional baker. It’s so easy, I may never buy commercial dough again. The secret to the twists is keeping the dough well chilled as you work. If it seems to be getting too soft to handle easily, pop it back into the refrigerator for 15 or 20 minutes, before moving to the next step. Be sure to plan for time to chill the finished twists before baking, too. You can shape them ahead, place them on the baking sheet, cover with plastic wrap, refrigerate and bake just before the festivities begin. Serve them with sidecars and you’ll usher 2010 in with style. Fill cocktail shaker half full with cracked ice. Add cognac, Cointreau and lemon juice. Shake thoroughly and strain into cocktail. Garnish with peel. Note: To shape citrus peel into an attractive spiral, remove peel from fruit with a vegetable peeler and cut into a long thin strip, then wrap peel around a straw or other thin tube and hold for a few seconds. Slip spiral over rim of glass for garnish. Line a half sheet baking pan with parchment paper or a silicon baking mat. Remove chilled pastry dough from refrigerator and roll out on a floured surface into a rectangle 1/16-inch thick and roughly 12 inches long by 8 inches wide. Don’t worry about precise measurements. What is critical here is the thickness of the dough. Beat egg with milk in a small bowl and brush the mixture over the top of the dough. With the long edge facing you, sprinkle 2 teaspoons of the minced garlic evenly over the middle third of the dough, then distribute ½ cup grated cheese over the same area. Fold the left side of the dough over to cover the cheese. Brush egg wash over the folded section and sprinkle with remaining garlic and ½ cup of cheese. Fold the right third the dough over the cheese to close the package. You should have three layers of dough encasing two layers of garlic and cheese in a rectangle about 8 inches long and 4 inches wide. Press the edges of the dough with a rolling pin to seal and roll out the package lengthwise into a rectangle 3/16-inch thick. It should measure around 12 inches by 4 inches. (At this point, if you have time, it’s a good idea to place the dough on the baking sheet and refrigerate for 10 or 15 minutes to make it easier to handle.) Trim ends of dough to make squared corners and cut the rectangle into ½-inch strips along its width. Twist strips into corkscrews, place them on baking sheets and press ends to hold their shape. Refrigerate twists, egg wash and grated cheese for 1 hour, until twists are cold and firm. Preheat oven to 425 degrees. Remove twists from refrigerator, brush with egg wash and sprinkle with remaining ½ cup of cheese. Season lightly with salt. Place baking sheet on center rack of oven, close door, lower heat to 350 degrees and bake for about 15 minutes, or until lightly browned. Check after 10 minutes to make sure twists aren’t browning too quickly. Remove from oven and let cool on wire racks. Twists are best the day they’re baked but they can be frozen for up to a month, defrosted in a single layer and crisped again in a 350 degree oven for 5 minutes before serving. In a food processor fitted with a metal blade, add flour and salt. Cut the butter in ½-inch pieces and drop into the flour. Cover with lid and pulse two or three times until butter particles are the size of large peas or beans. The mixture should be chunky. Combine lemon juice and ice water and add to ingredients in processor. Pulse on and off until dough begins to collect on one side of bowl. Do not allow to continue processing until it forms into a ball. You want a loose mixture that can be squeezed by hand into a rough mass. The dough should be cold to the touch. Place dough on a lightly floured work surface and push into a rough rectangle with your palms. Dust with flour and roll into a 12-inch long rectangle, ½-inch thick. Fold like a letter into thirds, bring the short sides into the middle. Place dough so the short side is facing you and roll lengthwise into a rectangle 12 inches long. Fold into thirds like a letter again and roll into a rectangle. Fold in thirds one more time, wrap tightly in plastic wrap or foil and refrigerate for at least 4 hours. Dough can be kept, refrigerated for two or three days, or frozen up to a month or so, for later use. Note: A third of this recipe is the equivalent of one sheet of puff pastry dough in the recipe above. Adapted from “The Complete Book of Pastry, Sweet and Savory,” by Bernard Clayton (Simon & Schuster, 1981). I don’t see why you couldn’t change the cheese. I wanted to replicate a favorite flavor combination but this technique should work with any cheese that melts well. I’ve seen variations with Parmesan, too. I did end up making these for New Years, and though I made them about twice the size, they were pretty identical otherwise. Very good! Of course I doubled the puff pastry, so still have some in the freezer. I also made some little puff pastry roll ups with pears and prosciutto. Rolled out the dough about 12×4, ~1/4 in thick, scattered finely diced pears and finely sliced prosciutto over the top, rolled it up. Refridgerated for about 10 mins (ought to have been longer, but it didn’t hurt any), cut into ~ 3/4 in slices and baked at 400 ~ 15 mins. Serious yummage!